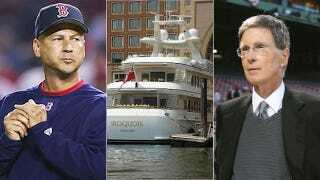 There was a somber mood in the Deadspin office last Friday, when we received word that Red Sox owner and billionaire John Henry had been rushed to the hospital after sustaining an injury on his megayacht in Boston. We wondered if he'd broken a bone, or gotten a paper cut from a million-dollar bill, or if he'd had too many cigars and passed out from the fumes. Henry also joked about his fall on his yacht last Friday, a short time before the Sox held press conferences after issuing statements that Francona's two-year option would not be exercised. "Thanks to all of the well-wishers. I'm fine. But it makes one appreciate health. Rushing downstairs is dangerous for an old guy." Henry even got on the defensive when a paranoid Boston fan accused him of lying ("FRAUD, You fall down the stairs the day the Sox can the manager of 8 seasons ? Nobody believes you"), responding: "It was sort of his fault. He was in a hurry and I was trying to make it there. Believe it or not." We hope this inspires the Henrys to install the appropriate rubber grip on the yacht staircase, so that they are able to safely travel from one floor of the yacht to the other floors in the yacht. It's just sensible, you know? And we hope that soon there is a picture of John Henry in a neck brace. Thank you for your continued support of Deadspin. You're all grand. Here's Hickey.